Oh, the holidays. Lots of yummy things that no one needs to eat, but that we still do anyway! Kettle corn drizzled white chocolate and peppermint? Sure! Even better, gluten free! 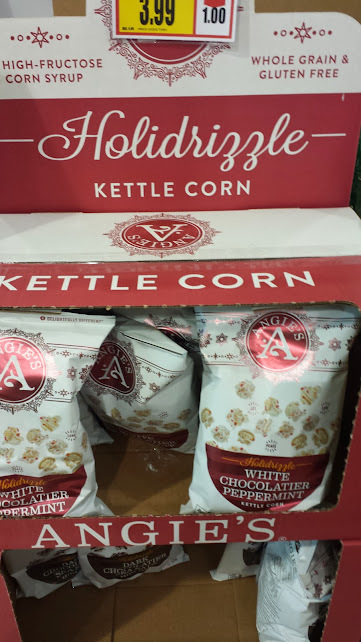 We recently found Angie’s Holidrizzle Kettle Corn in a nice display at Harris Teeter. This was about a day or so after Halloween, so the stores work quick to get these displays up and ready. Pretty nice to see ‘gluten free’ so prominently displayed on a front-of-store display, and while it worries and frustrates me a little (as they seem to market to the gf ‘dietiers’–see my rant here), I cannot hide my excitement to see more and more available snacks and treats. Especially holiday treats! We definitely do like our mix of salty and sweet kettle corn, so adding white chocolate and peppermint could not be a bad thing, right? As a parents of two Celiacs, we like to make sure the girls possess enough ‘unique’ holiday snacks for school. You never know when some student or parent will bring in a special treat, or we will need to make a snack for a party. With more offerings like this, we can feel good about the ability to pick something up quick and send to a school ‘learning activity’ (they do not say party anymore!!!) or for another holiday event. Angie’s (http://angiespopcorn.com/), if you recall, makes a variety of kettle corn and snacks, including Boom Chicka Pop, which we reviewed here.